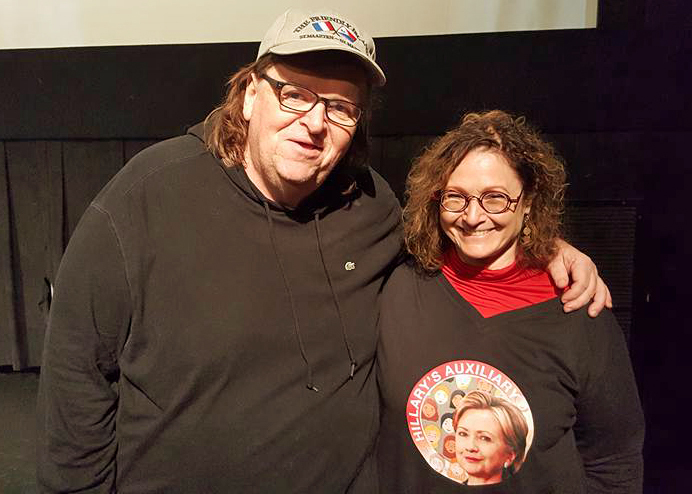 In his new film Michael Moore in Trumpland, the cinematic gadfly asks himself a really important question: "Since Hillary Clinton has always supported MY work, why have I done so little (so far) to support HER as a Presidential candidate?" Great Question, MM!!! The film ends with an exhilarating imagining of all the genuinely Progressive things a President Hillary Clinton will if she wins on 11/8/16. Astonishing piece of guerilla filmmaking (part exhortation part mea culpa) from a great American gadfly. Question One: Have I really seen all of MM's prior docs, or is that just hubris on my part? I walk out of Michael Moore in Trumpland, and this is the first thing I ask myself. The answer is important to me because I feel like I've just seen something fundamentally different even though so much of it is familiar. The answer is yes. Yes, I have seen all of the documentary films Michael Moore has released in theatres from Roger & Me in 1989 right up to Where to Invade Next in 2015. (I specify "documentaries" because I never saw his feature film Canadian Bacon, nor have I seen much of work he did specifically for television). But my creds are good. I have seen all of MM's docs and just like HRC, I have supported them all too. Top Photo: Michael Moore faces a skeptical crowd in Clinton, Ohio. Bottom Photo: Moore makes his appeal to the crowd on a set dressed with cozy furniture, surrounded by huge photos of Hillary Rodham Clinton as a young, idealistic Baby Boomer. 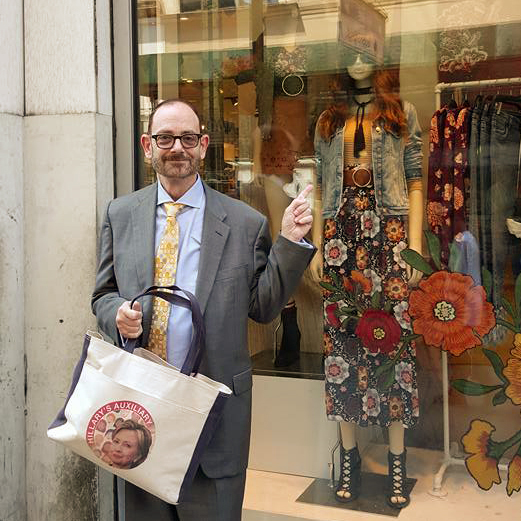 After Richard took this photo of us, I gave MM several Hillary's Auxiliary buttons, and asked him to help spread the word: "There IS 'enthusiasm' for HRC! There is TONS of 'enthusiasm' for HRC!! Please tell the MSM that you, Michael Moore, have seen 'enthusiasm' for HRC up close & personal!!!" Huge thanks to my hubby, Richard Bayard Miller, for helping me spread the word. 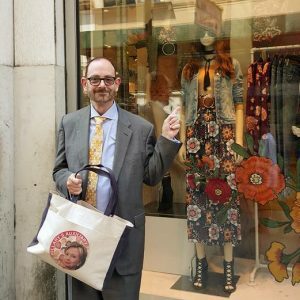 Here he is on 34th Street, proving my point that this 2016 campaign is generating a whole lot of 1968 Flashback moments.. Did I buy this skirt? No. But I was sure tempted. Look at how well it matches the design of my Hillary's Auxiliary logo... Uncanny!! !